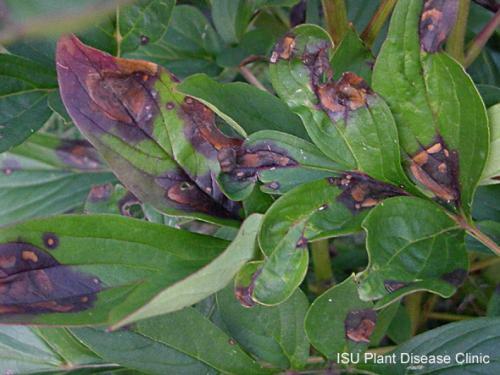 Peony leaf blotch is also known as measles or stem spot. Warm, humid weather provides optimal conditions for infection by the causal fungus, Cladosporium paeoniae. The leaf spots are glossy and purplish-brown on the upper sides of leaves. On the lower sides, spots are chestnut-brown. Infection is generally more pronounced at the margins of outer leaves. Leaves may become slightly distorted as they continue growing. Fungal infections on young stems first appear as elongated, reddish-brown streaks. As plant growth continues, infected tissue near the crown may darken and become depressed. Stems on the upper portion of the plant may show individual, raised spots. 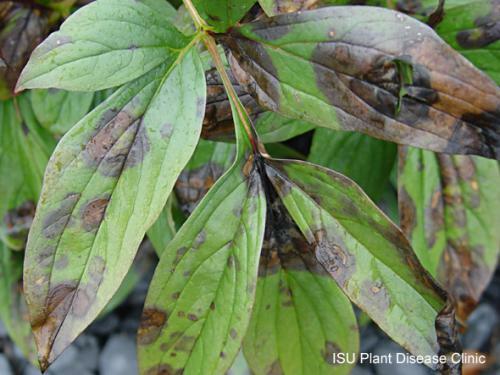 To manage peony leaf blotch, cut the stems at ground level in the fall or early spring. Rake the area before new shoots appear. Fungicides are available to help control the disease, but must be used in combination with other management practices. Also, providing good air circulation and avoiding wetting the leaves when watering can help reduce disease severity.